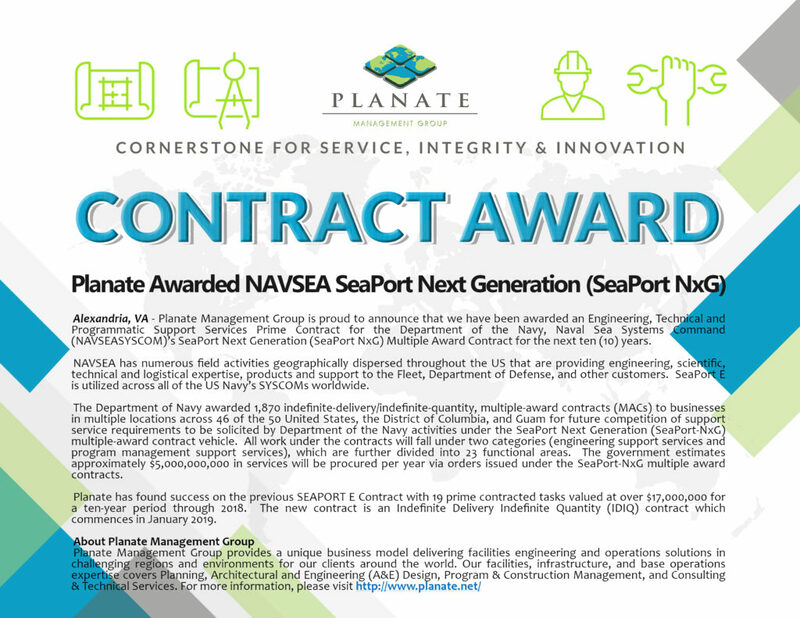 Alexandria, VA – Planate Management Group LLC is proud to announce that we have been awarded an Engineering, Technical and Programmatic Support Services Prime Contract for the Department of the Navy, Naval Sea Systems Command (NAVSEASYSCOM)’s SeaPort Next Generation (SeaPort NxG) Multiple Award Contract for ten (10) years. NAVSEA has numerous field activities geographically dispersed throughout the US that are providing the engineering, scientific, technical and logistical expertise, products and support to the Fleet, Department of Defense, and other customers. The Department of Navy awarded 1,870 indefinite-delivery/indefinite-quantity, multiple-award contracts (MACs) to businesses in multiple locations across 46 of the 50 United States, the District of Columbia, and Guam for future competition of support service requirements to be solicited by Department of the Navy activities under the SeaPort Next Generation (SeaPort-NxG) multiple-award contract vehicle. All work under the contracts will fall under two categories (engineering support services and program management support services), which are further divided into 23 functional areas. The government estimates approximately $5,000,000,000 of services will be procured per year via orders issued under the SeaPort-NxG multiple award contracts. These awards contain provisions to set aside requirements for small businesses, service-disabled veteran-owned small businesses, 8(a) business development program participants, woman-owned small businesses and historically-underutilized business-zoned small businesses. Planate has no specific responsibilities as of now as this is only a contract vehicle. It is an Indefinite Delivery Indefinite Quantity (IDIQ) which commences in January 2019. This contract is a follow on for the SEAPORT E IDIQ contract which Planate successfully was awarded 19 tasks valued over $17,000,000 for the 10 year period through 2019. Planate Management Group LLC provides a unique business model delivering facilities engineering and operations solutions in challenging regions and environments for our clients around the world. Our facilities, infrastructure, and base operations expertise covers Architectural and Engineering (A&E) Design, Program Construction Management, and Consulting and Technical Services. For more information, please visit http://www.planate.net/.